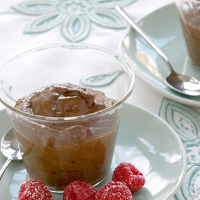 This rich, velvety mousse combines dark chocolate with the gentle warmth of ginger. Serve with fresh raspberries for a fantastic finale to a dinner party. Break the chocolate into small pieces and place in a large heatproof bowl with the butter. Set over a pan of gently simmering water and leave to melt for 3-4 minutes, making sure the bowl does not touch the water. When the chocolate and butter have melted, remove from the pan and allow to cool slightly. Place the egg whites in a large clean, dry bowl and whisk with an electric or balloon whisk until they form stiff peaks. Beat the egg yolks and brandy, if using, into the cooled melted chocolate mixture. Using a large metal spoon, fold in the egg whites until completely combined. Divide the mousse between 6 small glass dishes or espresso cups and chill in the fridge for at least 2 hours. Serve with a few raspberries, lightly dusted with icing sugar. Try using other flavours of chocolate such as coffee or orange, and Tia Maria or Cointreau instead of brandy. Recipes containing raw or semi-cooked eggs are not suitable for pregnant women, elderly people, or those with a weak immune system. For the latest government guidelines see foodstandards.gov.uk.